Rugged construction and excellent pricing make this pallet truck the best value for your material handling needs. 27"W x 48"L forks feature entry rollers and tapered design for easy pallet and skid entry, and are reinforced for heavy duty loads. This pallet jack has a 3-function hand control (raise, neutral and lower) and offers a spring-loaded self-righting safety loop handle to enhance comfort and ease of operation. Hardened chrome piston with protective dust cover ensures long, dependable service of this skid lift jack. Floor protective polyurethane steer and load wheels. Durable powder coat finish. 11-gauge steel forks with powder-coat paint finish feature a lift range of 3 in.-7.5 in. View More In Pallet Trucks. If you have any questions about this product by Pake Handling Tools, contact us by completing and submitting the form below. If you are looking for a specif part number, please include it with your message. Mighty Lift ML2772 Heavy Duty Long Fork Pallet Jack/Truck, 3300 lb Capacity, 27" x 72"
Lift-Rite Ergo-Lift Battery-Powered Pallet Positioner Pallet Truck - 3000-Lb. 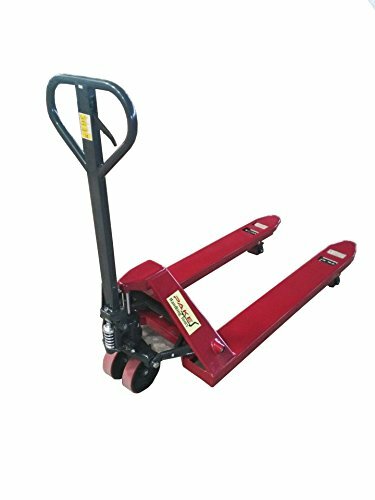 Capacity - 27X48"
Eoslift M25 Heavy-Duty Hand Pallet Truck/Pallet Jack, 27" W x 48" H, 5500 lb.